Michelle Duggan Brennan, Abbey Crescent, Cahir. Samantha Bell Conway, Mortlestown, Cahir. 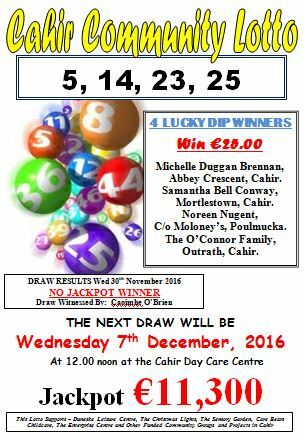 THE NEXT DRAW WILL Be Wednesday 7th December , 2016 At 12.00 noon at the Cahir Day Care Centre. Jackpot €11,300.